So,my internet has not been working...that is why there have been no new posts....not just because I am a terrible blogger :) We have had a busy few weeks. 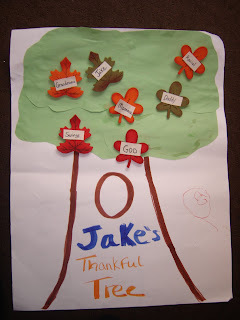 Jake and I did a little craft to try and help him understand what Thanksgiving was. We made a thankful tree and every day for the week before Thanksgiving I asked him what he was thankful for. I wrote down whatever his answer was (which is why there is leaf that says he is thankful for swings) We talked about how everything we have is because of God's blessing and that we should thank God for the things we have. The first day I asked him what he was thankful to God for and he said...God! The second day I asked him and he thought for a minute then looked at me and said YOU! 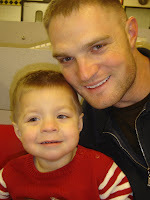 I of course had a mommy moment and tears came to my eyes and I grabbed him and kissed all over him. 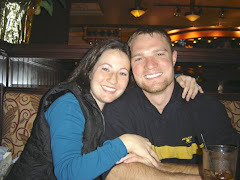 So, he figured out that this was a big deal and every day I asked him what he was thankful for he said "you" first. When my mom was in the room, she got on the tree because he looked at her and his reply..."YOU!" It is so funny how kids pick up on what makes you happy and try so hard to do it again. 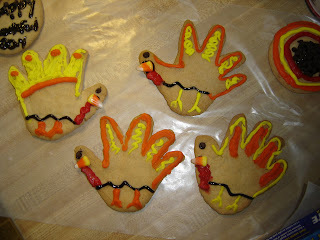 We made Turkey cookies by tracing Jake's hand and using that as our cookies cut out. 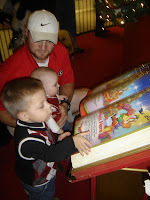 We went and saw Santa Claus. They both did pretty good. The worst part is waiting in line...Jake doesn't do too well just standing there. 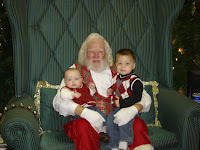 When Santa asked Jake what he wanted we could hear his response even by the camera lady..."Toys!" Thats all he'll say when you ask him, just "lots of toys!" Makes him pretty easy to get stuff for! 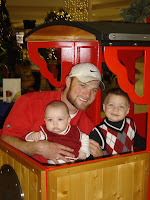 Then Dan and the boys rode a little train around part of the mall...Dan was sooo excited :) I am figuring out we are those gullable parents who pay too much to do little things like this. $4 a person to ride a little train for 5 minutes?! Seriously? At least I did not have to pay for Luke. 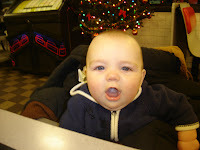 We also did our annual go to Home Depot for the Christmas tree and Waffle House dinner afterwards...(a little redneck?) 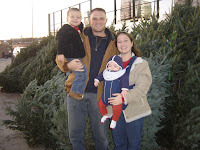 Anyway, I really wanted to drive to Sky Valley, NC and cut down a Fraiser Fir because that is the kind of tree we like and they don't have them in Ga. Well, we decided that a 3hr drive with a 2yr old and 5 month old would not be worth the fun of cutting down our own tree. So, we will wait and start that tradition when they are old enough to actually remember it. LOVE the update. REALLY LOVE the crafts. Makes me so proud to see you becoming more like me:-)HA! You are such a cute lil momma with all your little crafts I love it, even though "uncle Annie" didn't make the thankful tree! ps LOVE the picture of the boys in their Christmas sweaters!